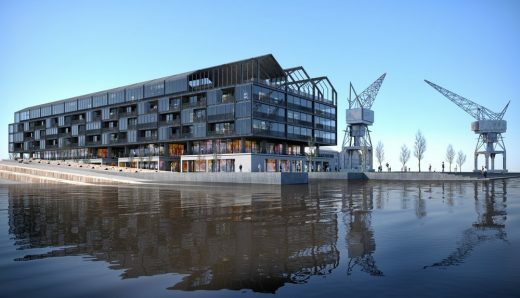 The new Shipyard Project of Tabanlioğlu Architects was honored as highly commended in the category ‘Future Projects – Commercial Mixed Use’ at this year’s World Architecture Festival. With its new project at the Golden Horn in Istanbul, TA_ wants to reclaim the identity of this area by redesigning the waterfront. The architecture firm TA_ has been awarded with two prizes during this year’s ceremony of Middle East Architect Awards in Dubai, attended by e-architect: Murat Tabanlioglu and Melkan Gürsel jointly as the “Architect of the Year” and Tabanlioglu Architects itself as “Large Firm of the Year”. Istanbul/Dubai – two out of thirteen awards were handed out to the Istanbul-based firm. When scoring the shortlist, the judges looked at submissions with the best description of company values, design principles as well as the number of successfully completed projects. 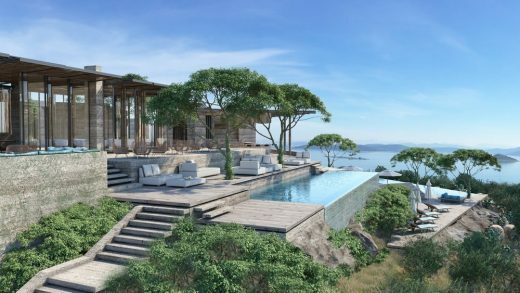 One judge recognised Tabanlioglu Architects’ wide range of work that was “incomparable”. In its 11th edition, Middle East Architect (MEA) once again celebrated projects, firms and architects who are making their mark on the region’s architecture industry. 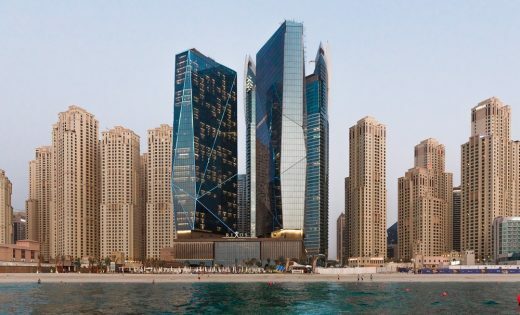 This year’s MEA Awards ceremony was held at the Ritz Carlton Hotel, DIFC, in Dubai on 21 November, gathering members of the region’s architecture community far and wide under one roof. e-architect Directors Isabelle Lomholt and architect Adrian Welch attended this event. 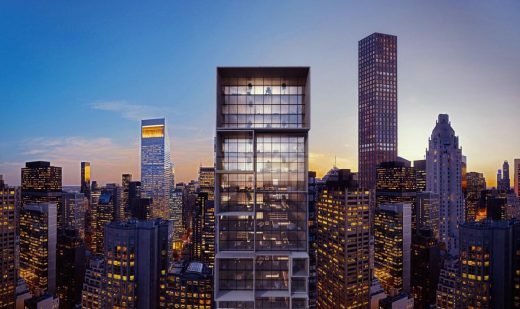 Located in a vibrant quarter, the mixed use project is mainly composed of a 35-floor apartment block and 30-floor hotel. Open to various vistas and reflections by the ocean, crystalline towers offer 360-degree panorama of the city, on “The Walk”, a few steps from the beach. 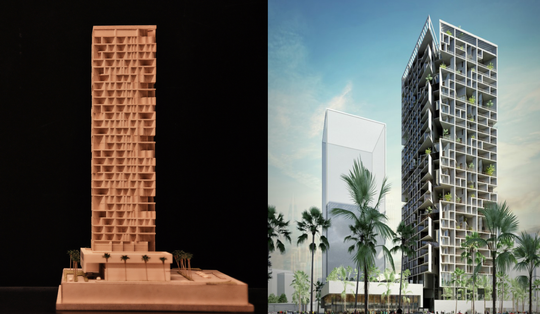 The Istanbul-based architectural firm is part of the First Annual Exhibition of The Athens Architecture Club with its Project “Lusail Benchmark”. The exhibition is presented by The European Centre for Architecture, Art, Design and Urban Studies in collaboration with the Chicago Athenaeum Museum for Architecture and Design. Istanbul/Athens. Among 24 architects from all over the world TA_ presents its project model “Lusail Benchmark” at the exhibition. Lusail is a huge urbanization project along the east coast of Qatar, in the northern part of the capital Doha.The aim of TA_s project is to come up with an outstanding design solution to create an instant residential landmark tower which should benchmark Lusail‘s urban life by blending the indoor and outdoor spaces and transforming the terraces or balconies as expandable indoor living areas. The design calls for a daring, innovative and modern architecture, functional in its distribution, contemporary in its style and sustainable in its components. This results in a self-generating architectural design that eliminates the excesses of subjective interventions and creates a flexible system that responds to the changing demands without losing the core conceptual spirit. Athens is the birthplace of Western architecture and art. To commemorate the founding of Western culture and civilization and to invigorate contemporary art in architecture today, The Chicago Athenaeum is forming “The Athens Architecture Club.”The principle of this club also has its tradition in Chicago during the late 19th-Century with “The Chicago Architecture Club” organized by Louis Sullivan, Frank Lloyd Wright, Daniel Burnham, and other leading practitioner of the time. The First Annual Exhibition of The Athens Architecture Club will take place at Contemporary Space Athens. Twenty-five architects will present their artworks including architecture renderings, drawings, sketches, travel sketches, paintings, sculptures, and poetry. 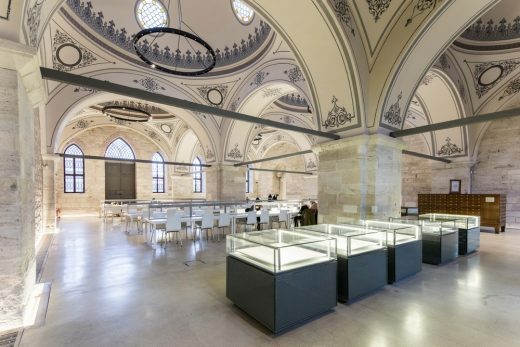 Restoration of one of Istanbul’s most prominent libraries, with its rare books and manuscript collection. Multistorey high-rise office tower is located at the financial district of Istanbul housing several of the world’s top financial institutions and other service sector leaders. Located in the largest city of the Aegean Coast of Turkey, the semi-open shopping facility appreciates and joins the lifestyle of Izmir where people prefer to spend time outdoors with respect to warm climate. Inspired by the climate and tradition of spending time outdoors the facility naturally creates leisure zones between shops. This building is not as large as the Astana Stadium but it is the building that really brought this Turkish architecture practice to world attention – beautifully articulated form, reminiscent of a Rubik’s Cube the rectilinear glazed form is animated with overlaid perforate sheethings. The existing construction primarily started as an office building; the building is re-designed as a residence within the Loft concept. The existing wall separating the building from the two adjacent factories is furbished as a “green wall creating a natural atmosphere. Istanbul is a city of youthful dynamism with its eye on the high-tech future and the profits and innovations. Recently, major investments in residential complexes are also contributing to bringing life back to city center; mix-use complexes and high rise residential towers arise or industrial buildings transform into elegant homes, designer lofts or idiosyncratic spots. The architecture firm TA_ was founded in 1990 by Murat Tabanlioğlu and his father, Dr. Hayati Tabanlioğlu. Murat Tabanlioğlu’s pronounced affinity for architecture can be traced back to his father’s architectural work, which stretches back into the 1950s. Since 1995, he, with Melkan Gürsel as partner, has led the firm step by step to international renown. Today TA_ counts more than 100 employees in offices in Istanbul, New York, London, Dubai, and Doha. The projects designed by Tabanlioğlu Architects range from opera houses and libraries to hotels, arenas, airports, and train stations as well as commercial, residential, and industrial buildings. TA_ has been the firm behind a number of key sites in Turkey. These include the Atatürk Cultural Center (AKM), Istanbul Atatürk Airport, Istanbul Modern art museum, and Bodrum International Airport. Its redesign of the AKM into the new Istanbul opera house is currently one of Turkey’s most exciting architecture projects. In an international context, the firm has been responsible for the Dakar Congress Center and Japan’s New National Stadium in Tokyo. November 27, 2018 in Architects.